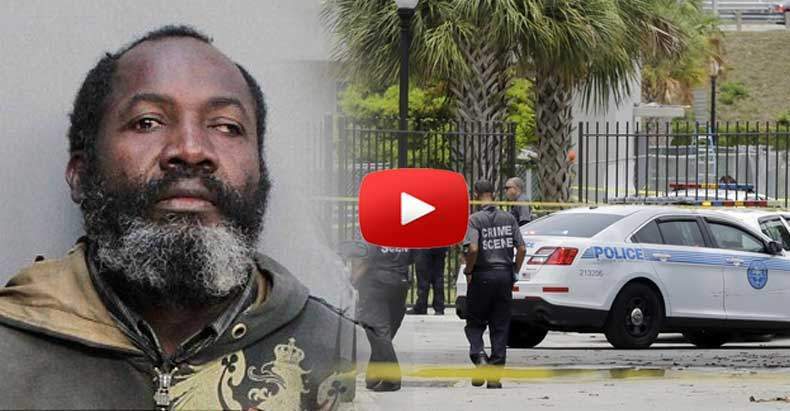 Miami, FL — A Miami police officer gunned down a homeless man in close proximity to a group of children Thursday morning, according to eyewitnesses. Up to 60 people witnessed the killing. Witnesses also told reporters he was not moving aggressively toward police. As many as 50 kids were said to be at the park on a summer camp outing. “The kids were hysterical. They didn’t know what was happening. They just ran,” witness Clarence Bonner told WSVN. Chief Llanes gave very little details during a press conference, stating only that he knows the officer discharged his weapon. Llanes qualified the lack of information by stating “We have anywhere between 40 and 60 witnesses that we have to interview, some of them being kids,” and added that he also did not know the trajectory of the assassin’s bullets. Wait, what? They couldn’t even get the location of the trigger-happy officer at the time of the shooting before this press conference? Good work boys. Officials have also stated that the killer cop, Antonio Torres a 20-year veteran, has been put on paid administrative leave pending a full investigation, which is protocol for every officer-involved shooting in most departments. Enjoy that vacation officer, I’m sure it’s well-deserved. We will update this with details as they arise.